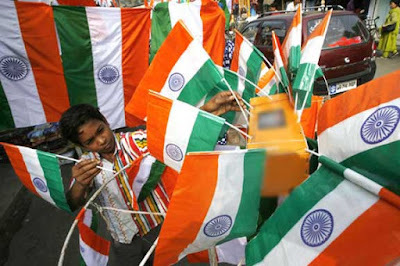 New Delhi : The government has decided to ban on sale and purchase of plastic-made national flags soon in the country, because of the offense of national flag after the Independence Day and Republic Day. "We will soon issue the order banning national flags made of plastic," a senior Home Ministry official said. In March, the Bombay High Court had asked Maharashtra Government to come up with a comprehensive policy to ensure a ban on use, sale and purchase of national flags made of plastic. The central government had also informed the court that a proposal to ban manufacture of national flags made of plastic was pending. "The government should come up with a comprehensive policy and create public awareness. Like the national anthem and pledge are printed in school textbooks, a message about national flags can also be printed," the High Court had told Maharashtra Government.